In the hectic world of a hospital, a computer-simulated nurse can be surprisingly comforting. A recent clinical trial of the technology found that Elizabeth also appears to have a beneficial effect on care. A month after discharge, people who interacted with the virtual nurse were more likely to know their diagnosis and to make a follow-up appointment with their primary-care doctor. The results of the study are currently under review for publication. 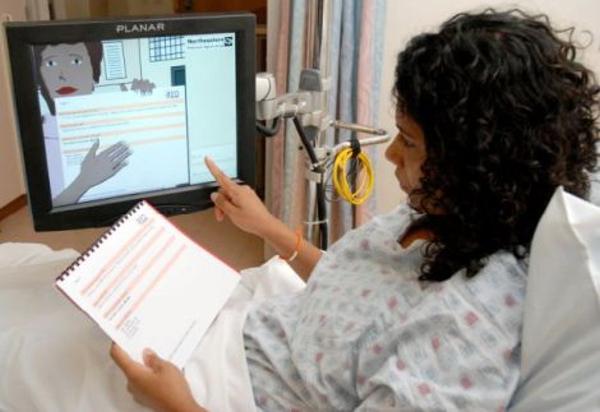 He adds that patients with little or no computer experience seem to prefer the virtual person to more standard computer interactions, because it feels more natural. “Most people get frightened when they hear they are going to get care from a computer, so to hear so clearly that we are not short-changing patients is gratifying,” says Joseph Kvedar, a physician and founder and director of the Center for Connected Health at Partners Healthcare. Kvedar has collaborated with Bickmore in the past. Researchers also add small talk, asking users about local sports teams and the weather, which real nurses and coaches often do to put patients at ease. The verbal interactions are fairly basic; the nurse or trainer has a set repertoire of questions, and users choose from a selection of possible answers. For anything beyond that repertoire, the virtual agent will refer the patient to a human health-care provider. Adding these apparently simple touches of humanity does appear to influence how people interact with the program. Patients more accurately reported their health information when interacting with the virtual character than they were when filling out a standard electronic questionnaire. Kvedar worked with Bickmore on a second, home-based trial, in which a virtual coach called Karen encouraged overweight sedentary adults to exercise. Users checked in with Karen three times a week, and she gave them recommendations and listened to their problems. Over 12 weeks, those who talked to the coach were significantly more active than those who simply had an accelerometer to record how much they walked. Some users wanted to know more about their virtual coaches, so Bickmore’s team experimented with giving the characters a backstory. They found that participants whose virtual coach told them stories in the first person were more likely to log into the system than those who heard the same stories in the third person. But not everyone responded well to Karen. One of the challenges in broadening the use of this technology will be creating virtual characters that can learn from users and adapt to their preferences. Bickmore’s team is now working on a virtual nurse that would reside in the hospital room. Patients can talk to it about their hospital experience, report pain levels, and ask questions. The researchers are also integrating sensors into the system, to record when the patient is sleeping, for example, or to track when different doctors enter the room. In a pilot study, patients had an average of 17 conversations with the nurse per day. “When we interviewed them afterward, we found that the agent seemed to be effective at addressing the loneliness you often feel if you’re at the hospital by yourself,” says Bickmore.